Neatorama has an interesting entry about the history of photography showing pictures of early cameras and the images they captured. Sky and Telescope – Your First Steps in Astronomy – If you look up and see a lot of stars that make you want to learn a bit more, this page is a good place to start. You want to stay in complete control of the situation and have accurate information. Guesswork is not good enough when it comes to the status of your power system. How much longer will my service battery last? What condition is my starter battery in? How much current is being recharged? How long do I have to wait for my battery to be fully recharged? How many charge cycles has my service battery undergone… The answers to all these questions can be provided by Mastervolt’s battery instrumentation. Regulation Part 18 Traffic Control – Mon Apr 3, 2006 – If you are looking for a job in British Columbia directing traffic in construction zones, this manual might be for you. Otherwise, it might be something to scan to see what is going on behind the scenes when you encounter a construction zone. HFD: All You Ever Wanted to Know About Fire Extinguishers – A.B. Kelly : Fire Extinguishing Blanket for Homes and Recreational Vehicles – be prepared! American Wire Gauge table and AWG Electrical Current Load Limits – how to figure out what size wire you need for that project. There is a nifty voltage drop calculator below the tables, too. Welcome to Innovative Lighting – WedgeLED ID Bar, Clearance, & Side Marker LED Bulbs; Series AUT194 – Maxxima LED lights for 4×4, cargo & utility trailers, trucks and RVs – looking for LED marker lights for your rig? My favorites, though, are the Airstreams. Wally Byam did more than market a distinctive trailer; he founded a streamlined, aluminum monocoque way of life. Byam’s first trailer, essentially a canned ham, appeared as do-it-yourself plans in a 1934 article in Popular Mechanics. 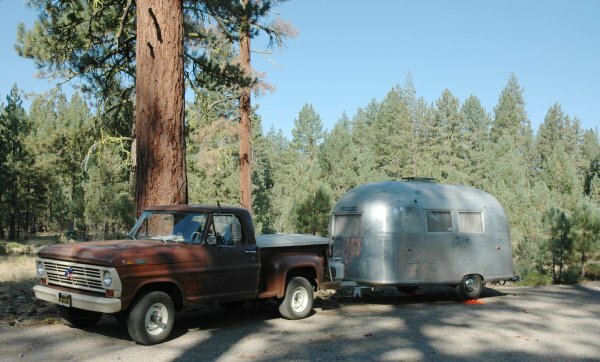 A year later, he took over the faltering trailer manufacturing business of William Hawley Bowlus (who had conceived the shape of what would become the Airstream). In 1936, the first Airstream Clipper was offered, its design and construction not dramatically different from today’s icon. Then, as now, dual shells of riveted aluminum are bolted and riveted to a welded steel chassis. Within the two shells are insulation and all the electrical wiring. The design is a true monocoque, its aluminum shell part of the load-bearing structure. Align-Quik Hitching Guides – to help you get your trailer hitched if you can see to the rear. Growing to be your first choice for RV sani dump / station information – find a dump station and help out by adding your knowledge to the database. The September 2006 Newsletter has been posted. See the link. * We were happy to welcome visitors, Don and Claudia East to the Hat Creek rally. Special events at this rally included an ice cream social (dessert) and a violin serenade by Brian Jaggard for our after dinner campfire. See the photo gallery. * Lahonton is the next rally on the schedule. From September 28th through October 1. For more, see the link. * Thanks to those of you who have already renewed your membership for 2007. We hope the rest of you will renew soon or if you are not currently a member, now is the time to join. You have several payment options. Harbor fright or fruit or whatever sells a torque wrench for $10 – $15 that you can use to make sure your lug bolts are properly set. There is some debate about cheap and so on but it appears that the HF wrench is reasonably accurate and can be considered disposable compared to the usual $100 medium and $300 pro models. 2. Always store them at their lowest torque setting. 5. If you drop the torque wrench on a hard surface (like concrete), it is advisable to have it recalibrated. Of course, distance dropped will be a factor – try to never drop your torque wrenches. 6. Avoid using extension bars – this will affect the accuracy of the applied torque. 7. Always apply torque in a smooth, jerk-free manner – this also affects torque accuracy. I usually “double-click” but not in rapid succession – for instance, if I’m torquing lug-nuts, I’ll click once on each, then recheck the torque again after I’ve torqued the last one – IMO, double-clicking will NOT over-torque, because the torque-wrench is designed to release at a preset torque value – so if it released (clicked) at 45 ft-lbs, the first time, it will immediately release when torquing pressure is applied the second or subsequent times without providing additional torque – UNLESS you do it in a jerking motion, in which case, you may indeed apply torque beyound the click. Once it’s clicked and you keep applying pressure, you’re basically holding a breaker bar instead of a torque wrench, that’s why it’s important to apply the torque smoothly and slowly – let the wrench do what it’s supposed to do. Your lug bolts will probably need a 3/4 or 13/16 inch socket for a half inch drive ratchet. It might be a good idea to pick up a half inch socket set at HF with the torque wrench as this will have the lug bolt socket as well as some sizes you might need for your hitch bolts. Odds are that you will still need a special socket for the ball nut and that that socket will be for 3/4 drive. That one, and a socket for the hub nut to use when doing bearings might be worth adding to the socket set with the appropriate adapters, too. By this time, the standard socket set, half inch drive set, torque wrench, plus special sockets gets to be a rather extensive toolkit to carry around. The inexpensive kits work well to keep in the garage for occasional use but probably aren’t really needed for you to carry on the road. On the road, you can check lug bolt tightness with a simple tug on a standard spare tire lug wrench. A good sized (12″ or so) crescent wrench will usually take care of any big bolt emergencies. So plan on what to take with you for what you will need and feel comfortable using. Then get good roadside assistance insurance. Odds are pretty good that your RV friends on the road – even the ones you never met before – will be able to help you out if you need help to take care of an unexpected contingency. KTVN reports that Logger Campground has been recognized as one of the top family friendly destinations by Reserve America. The nomination for this recognition was made by California Land Management, the company that operates the campground under contract with the NFS. Stampede is a holding reservoir on the Little Truckee between Reno, Nevada and Truckee, California. It is upstream of Boca Reservoir (see the CA 89 page). With the MLV Process, a large one-piece fiberglass vehicle body is quickly made to automotive quality precise dimensions, with a perfect exterior fit and finish. In the MLV Process, the fiberglass body skin is remarkably light in weight, but has more strength and rigidity than conventional vehicle body structures. This is made possible by specially developed automotive composite rigid structural foam, which is injected in a mold containing the fiberglass body skin and metal parts. The result is a low cost one-piece ultra lightweight large vehicle body of extremely high quality. TM Design Research is the same design group that licensed the Sky Deck to Airstream and Thor five years ago. That was the Class A with a circular stairway to the roof where seats and BBQ made for a way to get above it all in your RV. Every now and then the discussion surfaces about using foam insulation in Airstreams. The reason why fiberglass is still used is because the expanding foam disintigrates over time. The MLV process may solve that problem by using a special foam and making it an integral part of the structure with a fiberglass skin and internal structural elements. Its been tried in the past but success hasn’t been achieved. Do you think TM Design Research has something this time? 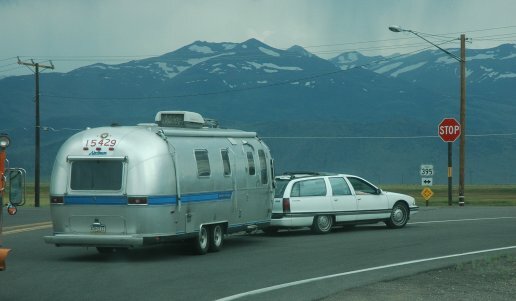 If Airstream picked up on this technique, owners would still qualify for WBCCI membership. It would be interesting to see if Airstream did use this technique to make a travel trailer with styling similar to its classic line. This one’s a Buick station wagon from Pennsylvania headed over Tioga to meet family at Yosemite. What’s under the hood of that station wagon isn’t what it came with, but you’d have to ask the owner about that! This retired high school art teacher figures his rig is just another art form. Whether its a custom new Zolatone interior, frame strengthening, or a new power steering system in the tow vehicle- hey, its just an artist expressing himself. Even Claudia joined in to buck the rivets – no olympics blind rivets on this shell! See the photo gallery. Note the refrigerator vent and access door. It seems these changed quite a bit from one trailer to the next. Didn’t get to the Hat Creek SNU Rally? See what you missed! The photo gallery is posted. This is Don and Claudia’s rig. Wilderness dishwashing; yes they study that, too. How to Wash Up in the Wilderness describes a study by microbiologist Joanna Hargreaves. The larger the group, the higher the potential for an unhygienic individual to put higher numbers [of fellow campers] at risk. Montezuma’s revenge or whatever you want to call it is not a way to spend your time in the woods. 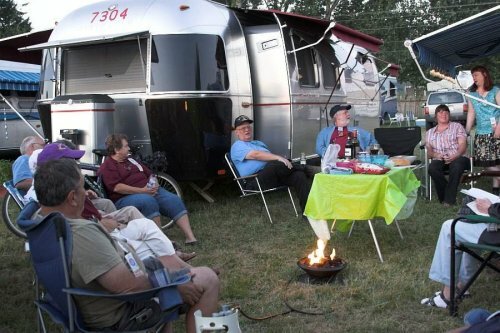 See RV Food Safety and Washing tips for RV Living for other ideas about how to reduce risk of an unpleasant experience at your next rally or campout. Early in the evening they are usually the first stars to be seen or late in the morning the last to fade away. The planets don’t stay in fix constellations and have their own pattern of wandering about the background of stars. There are five of them you can easily see. The world’s astronomers, under the auspices of the International Astronomical Union (IAU), have concluded two years of work defining the difference between “planets” and the smaller “solar system bodies” such as comets and asteroids. The new definition has two fundamental criteria. A planet must orbit a sun and it must be big enough (maybe 800 km diameter) that its gravity determines its shape. There might be a sub-category of planets to be called plutons that have orbits longer than 200 years. These usually have rather wierd orbits and other strangeness and are hard to see. A planet is not a sun. This ‘not a sun’ requirement is an upper limit on the astronomical body’s mass. That gets into the question “what is a sun?” and that just illustrates how these kinds of effort to define what one is talking about can go farther and farther as more accuracy is needed. This definition adds an asteroid, Ceres, as a planet as well as three others beyond Pluto. So today’s children will learn about a dozen (or more planets) rather than the just eight or nine that have been there for most of us or the five that were there for the ancients. Update: It appears that a third criterion added limited the list of primary planets to 8 and put Pluto in the “dwarf planet” category. This third criterion is that a planet must dominate its orbit and be the biggest thing in it. That eliminated Pluto whose orbit crosses that of a larger planet. Carol gathered some memories of a reception at the WBCCI Rally in Salem. Here’s the photo gallery! Good society, good friends, good entertainment, refreshment, and even a campfire – What more to end the day in a way to remember. If you are into reading, especially the classics from days long gone, this is a good time for you. Manybooks.net is one source of free eBooks for your PDA (or iPod). And then don’t forget that there are 18,000 free books in the Project Gutenberg Online Book Catalog. Or you can go to places like classic literature and find all About Sir Arthur Conan Doyle and Sherlock Holmes. There’s even a 1984 Child Care Manual (PDF) if you need help on that score. Then you can get into howto’s and repair manuals and other self help stuff. More on that later. Heading north on US 395 from Reno starts with a tour on the north skirts of Peavine Peak (8260′ the title picture is Peavine from the east). There is a bit of a grade over to Cold Springs and Bordertown but it is short. After crossing over to California, you follow Long Creek all the way to Honey Lake along the east side of Diamond Mountains. East of Doyle are the Fort Sage Mountains and north of that is the Sierra Army Depot in Honey Lake Valley. Approaching the big town of Susanville (or wikipedia), one of the oldest communities in this neck of the woods, you pick up the Susan River (water quality report, Bizz Johnson Trail and more about the 18 mile trail along an abandonded railway). This is followed out of town on CA 36 which is a rather steep grade right on the eastern edge of town. Susanville is probably the place to gas up en route. There are several stations along both sides of the main drag but none of them are really RV friendly. CaliforniaGasPrices.com hasn’t any reports of prices at last check. A list of stations with phone numbers doesn’t render right in Firefox but might be a resource if you really have to call ahead to check. MSN might have some data or check the SNUZE entry. Count on twenty cents or more per gallon than in Reno. Highway 36 heads over towards Lake Almanor where it joins CA 89 for a spell on its way to Red Bluff. 89 goes north through Lassen National Park, another way to get to Hat Creek, or south to Truckee and Lake Tahoe. The pass through Lassen is at 8512′ and Lassen Peak is at 10457′ – closed in winter, the Lassen Peak Road is not one to take on a whim in an RV. Just a couple of miles out of Susanville on CA 36 you pass route A1 that goes over Eagle Lake Summit (6340 ft) and around Eagle Lake to join back up with CA 139 coming north out of Susanville. Route A1 is OK for most RV’s if you don’t mind first gear, a lot of curves, and aren’t in a hurry. A couple of miles past A1 on CA 36 is the CA 44 turnoff opposite Cheney Creek, a walk in campground. CA 44 is a 52 mile run from Susanville to Hat Creek and CA 89. It travels through Lassen National Forest going around the northwest side of Lassen Peak. CA 44 runs on the south side of Rhoop Mountain (7608′) and then along the north side of McCoy Flat Reservoir (5356′). A little farther on is a rest stop near the USFS Bogard Work Center. 44 then heads through Gray’s valley and around Poison Butte (6367′) towards the Hat Creek Rim. There is a scenic overlook and Pacific Coast Trail head at the edge of the rim before the road takes a dive off the rim and around the Devil’s Halfacre to terminate at the intersection with CA 89. Just north of this intersection of CA 44 with CA 89 is Cave campground and the Subway Cave. Just south is a visitor’s information center, the community of Old Station, and the Hat Creek campground. These are near the headwaters of Hat Creek as it heads north along CA 89 22 miles to the intersection with CA 299 and then on to Lake Britton and the Pitt River down to the Sacramento River. ExRx has a page for beginners that provides some good information for those who feel the need to improve their fitness a bit. Everyday activities such as walking the dog, gardening, taking the stairs, and mowing the lawn are good ways of adding to your overall activity. Most important is to enjoy the activities you do. This makes the benefits even more worthwhile. You are improving your health and you’re having fun too! The site is intended to be a free resource for the exercise professional, coach, or fitness enthusiast. It has more than 1900 pages of information. They sell stuff but the site is still a good resource for exercise, fitness, diet, and related matters of health. The August 2006 Newsletter has been posted. See the link. * Hat Creek promises to be another highlight. We are planning an ice cream social for Saturday so bring your favorite flavor and topping to share. * Want to find out what to do and what to see at Hat Creek? Check here. * It is time to renew your membership for 2007. Now you have more payment options. See you at Hat Creek! Hat Creek, what to do? Hat Creek – (Wikipedia) campground is on the upper part of a creek with stable water flows and temperatures that follows highway 89 from Badger Mountain to Lake Britton near Burney Falls. It is at the base of Sugerloaf Peak between just north of Lassen National Park. There is a lot to see and do whether you are into fishing, hiking, touring, campfire watching, spelunking, or even socializing in some of the small town events and facilities. Hat Creek Area Campgrounds – a good rundown on the campgrounds along CA 89 and Hat Creek. Pacific Crest Trail Hat Creek (pdf) – describes the section of this very long trail in this area. Fishing – It appears that the upper section is more for spin casting and the lower section for fly fishing. But consistent flows and temperatures make for good fishing all along the creek. Obervatory – There is a radio observatory just up the road a bit that is a research site for several California University astronomy departments. NASA Hat Creek Site Information – geology and locations of markers at the obervatory. Weather – Here’s where to get a weather forecast for the area. RV parks and commerce – if you want a few amenities, these places might be for you. Clubs – Many organizations gather in the area and have their experiences recorded on their web sites. Hat Creek Rifle and Pistol Club-Northern California. Subway Cave – is a lava tube – you can see more of these at the Lava Tubes National Mmonument north towards the California border but Subway Cave is a pleasant surprise for spelunkers just down the road from the campground. If its still there, there is a dump station across the highway from the campground. That makes it a bit easier to spend some time camping in the area to see all the sites and do some exploring. We finally captured Don and MaryLou’s well travelled ’98 Excella Classic. Its a typical late nineties Airstream, complete with cat. See the photo gallery. There are a number of photo galleries that have been added or updated with pictures of the Mono Lake area. Mono Lake was quite full this year. The photo gallery shows what it looked like in 1982 as a comparison. There are also pictures of the infamous Conway grade. This is only 6% but is a long slog at high altitude. The SNU rally at Obsidian Dome in July 2006 photo gallery was a good chance to see the dispersed camping possibilities for medium sized RV’s. The Sagehen Summit photo gallery shows the view and the potential location for another rally. This one has been updated recently, too. Karen also has a photo gallery of potential campsites in this area from a couple of years ago. The photo gallery of Mono and Topaz lakes also has some scenery from times past.